There are about 100 species of Orobanche (common name: broomrape) worldwide, mostly in temperate areas. Orobanche is a parasite on the roots of other plants. Orobanche has no chlorophyll. The flowers suggest flowers of penstemons, monkey flowers, or snapdragons, and Orobanche is closely related to those plants. 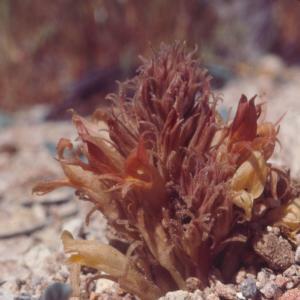 However, Orobanche goes into a family, Orobanchaceae, that now also includes Indian Paint Brush (Castilleja), which is a green plant that parasitizes roots of other plants. Some species of Orobanche are rare, but some are common and even pests. Orobanche ramosa is a serious parasite on tomato plants in California.